Thank you for your interest in Kraken Volleyball Club. We are looking forward to an awesome 5th year of Kraken VC and getting to know our athletes and families. Please follow the below steps to properly prepare for our upcoming tryouts! We are fielding teams in Seattle (Reef & Tide) and Renton / Fed Way / Kent (Surf & Sand). We will have our complete Season Info page posted prior to the first tryout date. We intend to form at least 1 team per age group in our Seattle and Renton/Kent locations. Tide and Sand teams generally have a less intensive travel schedule but receive the same high level coaching/training. Open Club Team Spots - Seeking Players! Please register for makeup tryouts at the link below. Determine your athlete's age division eligibility by visiting the Age Group Eligibility page. Athletes are eligible to tryout / join older age group teams, but cannot participate with a younger age group than their eligibility. 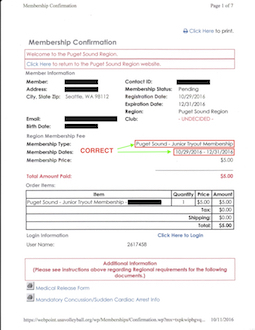 Step 2: Save a copy of Membership Confirmation to desktop once you have completed Step 1. This file may be delivered to your email rather than displayed upon completion. Step 2: Please bring the 2 completed forms to tryouts. Your athlete will not be able to tryout without having brought or uploaded the forms. You can upload the files during registration if you would like. But we still recommed bringing completed copies. Click the Register now button below to begin the online registration. A registration must be completed for each tryout date/age group that your athlete plans to attend, including makeup dates when they are published and open for registration. Once you have paid for a tryout, there is no need to pay for additional tryout age groups or make-up dates. If you receive a waitlist notification for an additional age group or make-up tryout date, please disregard as it is a system automated notification. Please have your athlete suited up and present at the tryout time stated. If your athlete is on the PSR Not In Good Standing List, this means your family has a current financial obligation from a previous club season. Please contact your athlete's previous club for resolution. Your athlete will not be able to participate in any tryout until the issue is resolved. Verify that you have completed all steps in Sections 1 thru 4 above. Please bring copies of the complted forms with you to tryouts. You have the option of uploading the documens during registration. Please park legally in the center parking lots or on the street. At about 30 minutes into each tryout session we will have a brief informational meeting about our club. We will go over our coaching methods, training location information and travel details. The meeting should last about 20 minutes. We look forward to meeting you and your athlete. Applicant athletes will be put through a series of drills to evaluate their volleyball skills. Selections/invitations to join Kraken VC will be extended based on athlete’s current skills assessment, the potential for improvement, as well positional fit based on the pool of athletes. Verbal invitations may be extended by Kraken VC any time during the PSR tryout period. Athletes may verbally accept a Kraken VC invitation during the PSR tryout period. Athletes must sign/return the Kraken VC Player Contract with the Tuition Deposit by the Puget Sound Region signing date. All athletes need to complete their USA Volleyball Membership upgrades to a Full Season status within 1 week of the upgrade being available. Returning Kraken VC athletes from the 2016-2017 season must accept and complete contract upon receiving an offer. If the contract is not completed, the athlete's spot will remain open and may be filled with another athlete. Incumbents must make the signing payment upon offer and acceptance.